← Non-violent revolution, is it possible? We’re on our way! Thanks to you our crowdfunding campaign has exceeded our goal. We are now assured that we will have sufficient funds to carry out our planned work in Europe this summer. Altogether, the tour will span 9 weeks from mid-June to mid-August. The first half is pretty solidly booked with multiple events in the Netherlands, Sweden, the UK and Greece; the second half is a bit more flexible with some room for spontaneous developments. As you know, the debt crisis continues to worsen. Austerity for Greece is still in the news, and depositors with funds in Cyprus banks have been forced to take a “haircut.” Don’t be surprised if bank deposits in other countries get raided in like manner by their respective governments. While the spotlight is presently on Europe, this crisis is global and bound to worsen. Virtually every country of the world has a central bank, and those in the developed world at least, work together. Every one of them is set up to allow their respective governments to deficit spend, and banks to lend our own credit back to us at interest. They will monetize the debt to whatever extent is necessary to keep the game going. 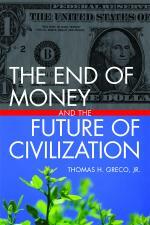 The exponential growth of debt is inherent in the way money is created. It must stop somehow, sometime. All efforts to keep it going are futile in the long-run. Currency inflation and cuts to social programs are the paths that bankers and policy makers have chosen, but that will do no more than delay the inevitable, and in the process create more pain for the masses. Either we create new methods for exchange and finance, or we descend into chaotic collapse and widespread civil unrest. Let us hope that this year will see the widespread emergence of decentralized, community-based, credit-clearing networks. That’s what my mission is all about, and that’s our the best approach to making a peaceful transition to a steady-state economy and sustainable way of life. Again, my sincere thanks for your help in supporting this important work!